Time’s Up was introduced to the world in 2018 in a dramatic fashion as Hollywood’s most powerful women turned a red carpet black to protest sexual assault, misconduct and inequality in Hollywood and beyond. 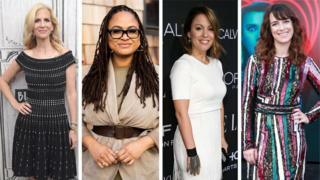 But despite a lot of good intentions and a lot of talk in Hollywood about a new era for women – yet again there were no women nominated for the best director prizes at any of the major awards shows. So why aren’t more women directors killing it? “The industry is a slow-moving one, a conservative one that resists change,” says Nithya Raman, the director of Time’s Up Entertainment, who does believe the culture of Hollywood has changed. That’s likely why the Oscars best picture race is relatively diverse this year – from Roma, to Black Panther from Green Book to BlacKkKlansman. If Beale Street Could Talk director Barry Jenkins says he’s heartened by the number of black filmmakers competing this awards season. Jenkins’ film Moonlight won the best picture Oscar two years ago. “When I was here before you didn’t have three black films in the same category as you do now,” Jenkins told the BBC on the Golden Globes red carpet. “I would say there are a lot more opportunities for women directors but I would say that progress is a lot slower than you might have expected,” said Leah Meyerhoff, the founder of Film Fatales, a group of female directors who support each others work and advocate for gender equity in show business. “Hollywood is a giant ship and is slow to turn,” Meyerhoff said. At the Film Fatales meeting, women noted that they’ve received more opportunities for job interviews and are being invited in to pitch more often – but they’re not necessarily getting hired. “At least we’re getting on the lists, getting in the room,” said director Elissa Down. When asked if there had been a backlash because some complain that less experienced women were getting opportunities ahead of more experienced men, Down laughed and quoted a studio exec who told her “we’ve been celebrating male mediocrity for years”. “We know we’ve made it if we celebrate female mediocrity and people of colour mediocrity – so yay!” Down said. Women fared better when it came to directing television. According to the Directors Guild of America, women directed 25% of all TV episodes last season – up from 21%. This year, Time’s Up urged Hollywood’s most powerful actors and producers and executives to commit to working with a female director in the next 18 months. The plan is called The 4 Percent Challenge. It’s called that because of the top 1,200 studio films over the last decade – just 4% were directed by women. People often refer to the “female lens” or the “female gaze” when talking about women directors, but Hammer said the experience working with Leder was the same as working with any talented director. “That’s what makes it even crazier – it makes it even more bizarre that it doesn’t happen more,” he said. Ms Raman at Time’s Up Entertainment says she thinks the number of women working in film will be significantly higher next year, because it typically takes years to set up a studio movie. Meanwhile, Time’s Up is starting a mentorship programme and their legal defence fund has raised more than $20m.